l started to make plans for a greenhouse l plan to build in the late summer, to be able to feed my family fresh fruits and veggies year round. 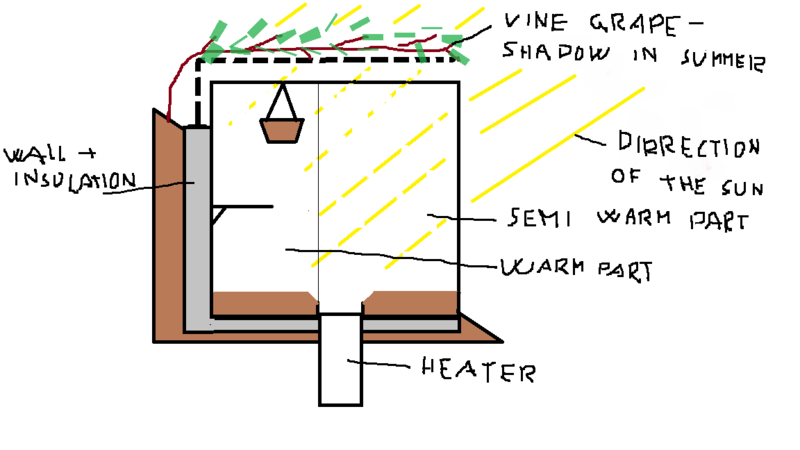 Makeing a greanhouse isnt hard if you have lots of money and resources, but a DIY cheap efficiant HEATED greenhouse culd be a nother thing. And this is what l plan to do. This will be half (north side) dug in to ground (positioned on a hill). The shell will be made with 2 layrs of bubblewrap foil (insulation) and thick UV resistant foil on top, to protect it from the elements. The winegrape on the top partialy shades half of the greenhouse in the summer, thus preventing overheating (ventilation will still be nessesery) while provideing unlimited sunlight in winter, when the leafes fall down. The whole sistem will be about 3mx6m 2m high, not too big, shuld be enough for a few salads and stews in the winter. l wrote down the Farming part, now for the woodgas part! 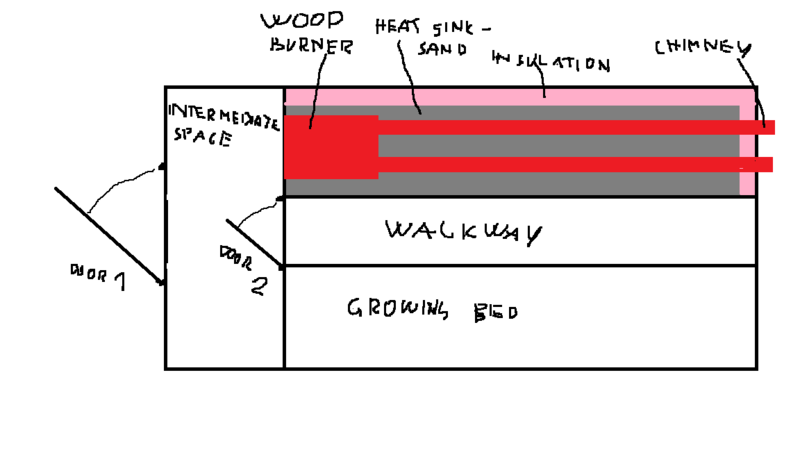 l plan to heat the greenhouse with wood. Exactly how, l wanted to discuss with you guys. this is a top wiew. l am leaning towards JO"s woodgas boiler style sistem. A woodgas burner with insulated hot water reseroar, both out of the way under the path between the greenhouse compartments. lf anyone has any suggestion or ideas, experiances perhaps, plese, do chim in! Interesting concept K L. What is the vertical line between the two heat compartments - glass? I would go the simplest route. Brick a fireplace, no need for downdraft, and channel (brick or pipe) the exhaust through a huge bed of sand. No water, pump or electricity involved. The heating ideas all sound like good approaches. The hard part will be to make the heat even enough to sustain over the coldest winter nights, and to not stress the plants. For practical purposes it may be best to expect little or no production for the months of December and January unless artificial light is used. Heat losses though the glass will be very high whatever quality of glazing is used. Insulated shutters could be employed, but risk breaking glass from thermal stress, and would greatly add to complexity and effort to operate. In extreme climates like here the winter months may be so hard to heat as to be less efficient than growing indoors under artificial light. Or perhaps heliotropes / light pipes? Phase change materials can be employed for thermal stability. The simplest concept is to build a back wall of black water containers, the thermal lag would be helpful. Interior mass of any kind will be the greatest aid to maintaining adequate temperatures. Glazing should be oriented to be perpendicular to winter sun for maximum penetration then, and a sun shade to block summer sun. I would be concerned about the top glazing with grape vines in case it snowed heavily, the snow would be very hard to remove. Also the glazing would be very hard to keep clean, negating the purpose. For me, December, January and February is out of the question, No need to even try. Thanks guys, for all the ideas! policarbonate or glass, maybee eaven foil. Will see what the resources give. Koen, good idea, but automated? Have you got something specific in mind? perhaps you are right. But how huge you think we are talking about? The thing is l want the sistem to be able to run unnatended for at least 24 hours, 48 wuld be preffered. We fire it up now and then just for that nostalgic feeling, and it stays warm for about 2 days. 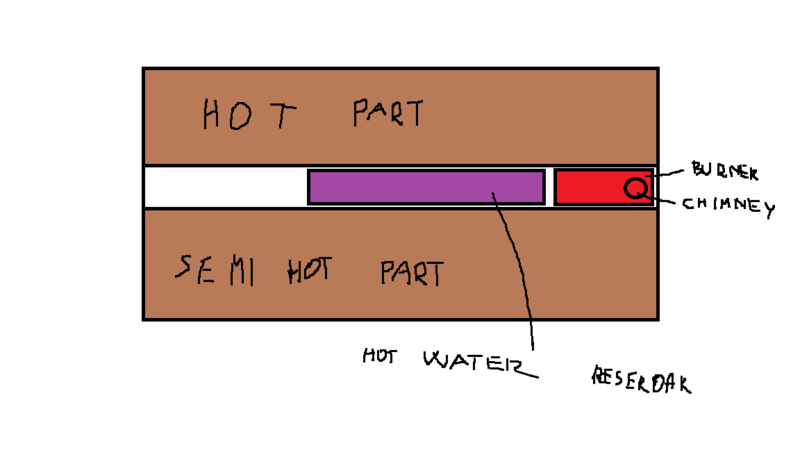 But its hard to meter how hot it gets… Thats why l first went the water/thermostate route. your black water wall idea has a check for a must install. Thanks on a good idea! New shoots then sprout out each year, about 15/plent about 2m long, so plenty of partial shade and clear in the winter. Puting Jan Olas idea in to a count, keep it simple, while utilize the grounds natural heating capability. Ha l missed that post! Good idea. Hope it works! With the chimney passage ways UP the back dug in retainer wall. Give you the pulling Up drafting. Safety; always drafting when cooling off, unattneded. Air and flow only controlled by the air tight capable fuel entry doors. Never a chimney “dampner”! That is an open fire place, non -airtight stove control “fix”. A sooner-or-later CO killer. 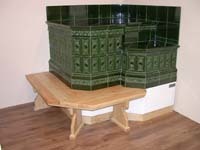 A combo of the old Roman baths system and the Russian/Siberian horizontal bed-stoves. I quickly read through this topic and didn’t see any reference to the advantages of extra CO2 for plants. I am considering the use of a TLUD as Koen suggested because of this extra CO2 advantage. I think a TLUD can be made quite tall for longer burn time. l agree 100%. Ofcorse, a wood burner without a vertical chimeny wuld end up sadly (unless a fan is used, but you presented obvious CO and smoke threat). We had a Siberian stove as you describe above when l was young. Man those are great. Our was filled with sand, but only stayed warm for about half a day. 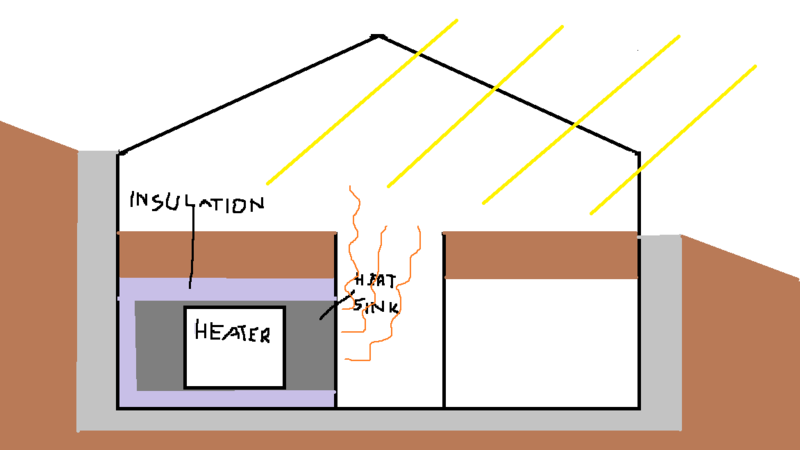 l think clay and concrete might be a better idea in terms of heat accumulation. what do you mean with higher CO2 concentrations useing a TLUD? A TLUD used inside a greenhouse without a chimney produces heat and CO2. Both make plants grow better. I am working and thinking on an extended season greenhouse/ sun space as well. Watching and thinking. Mine is attached to the house. It is a used solaraim. Aluminum with curved 3/4" thermal pain glass. I used 2" extruded polystyrene insulation vertically around the perimeter to 3’ below grade. I also used2" horizontal to 32". 1 ’ below grade. At this time I have only an open door from the house for heat. I have been using it since early March in northern Wisconsin. I have been eating salad greens for a few weeks now. The room in a room is a must to store heat . I think hydronicly heated beds with low tunnels are the way to go. I have been collecting free used bricks to add mass. I also plan to add fans to pump excess heat in the house. ( I have saved on the wood immensely already this spring without a fan. ) I also plan to duct it below the floor when not needed in bed the house. 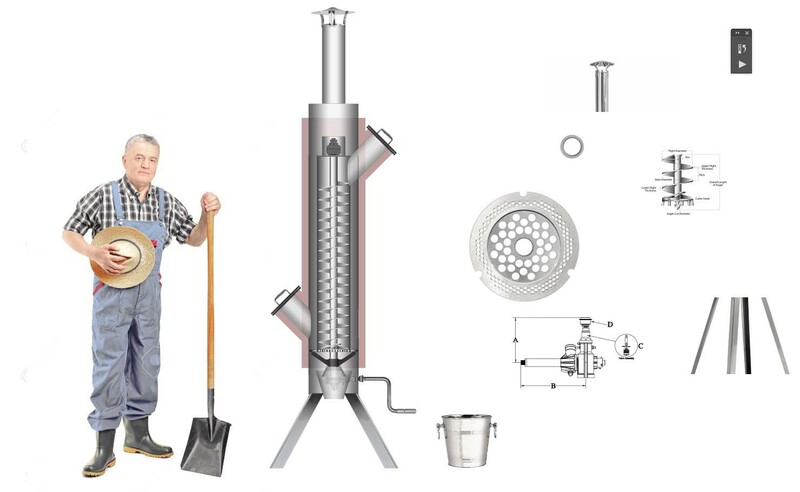 I plan to put large hot bc water storage tanks below the floor that can be heated with solar, wood , compost or eventually waist engine heat from a generator. I have also been reading up on aquaponics. Another large volume of thermal mass. I am hoping the ground will regulate this water temp to mid 50’s to raise trout and greens. The water can also be tempered by adding fresh water and watering the garden with with fish tank water. Lots of ideas less time and no money. Good things take time. How do you ensure that the co2 rate has not been harmful to your health?